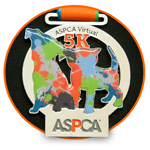 This June, Grundoon and I will be participating in the ASPCA Virtual 5K! Grundoon is a blond labor-poodle mix, and while he and his brother is pictured here, Kyle will be unable to join us this year, he's an older dog and his joints are no longer able to handle this distance. Kyle will nonetheless be cheering us on from the sidelines! I've always loved animals and therefore am excited to help raise awareness and funding to support the ASPCA's programs. Your donation will help the ASPCA provide life-saving programs and services to millions of animals nationwide. This organization is quite important to me, especially since they rescued my dear cat before we adopted him when he, the runt of the litter, was abandoned on the streets. I truely appreciate your help as we fight to give abused and homeless animals a second chance at life! Thank you!